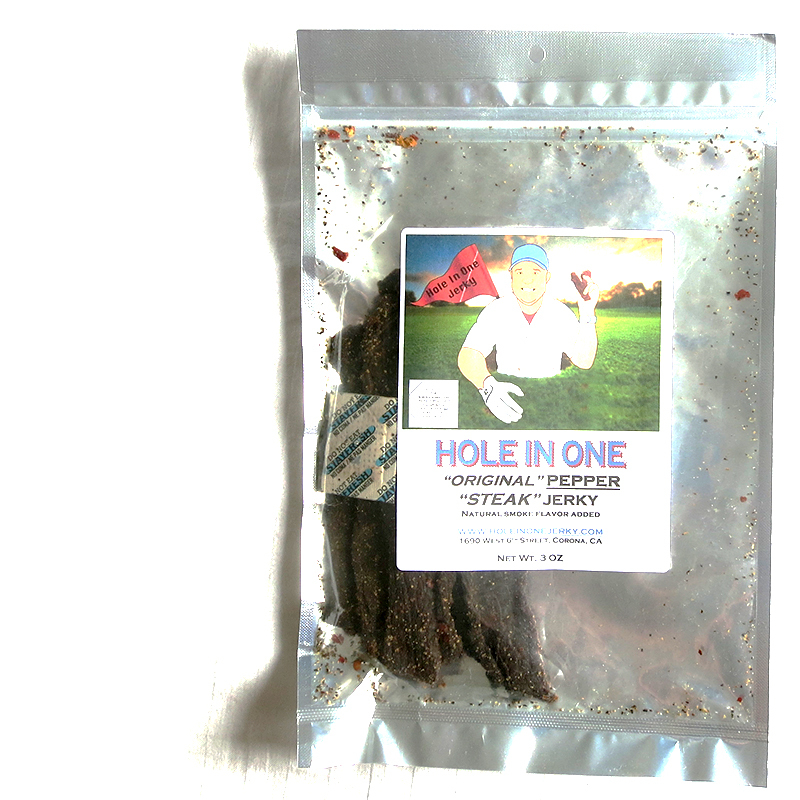 Hole In One Jerky is handmade from USDA Choice London Broil, and comes in five flavors. They currently sell online, as well as a small brick-n-mortar, and six beer breweries. Beef, soy sauce, worcestershire sauce, water, black pepper, onion & garlic powder, cayenne powder, brown sugar, crushed red pepper, natural smoke flavor. The first thing I taste from the surface of these pieces is a saucy flavor which brings on a seasoning of cayenne, black pepper, onion, and garlic. The cayenne spiciness comes on and ushers in some heat. The chewing brings on more of the sauce, which by now pronounces itself as worcestershire, but tempered down. For being labeled as "Original Pepper Steak", this does have a well-defined black pepper flavor, and gets to be rather strong after eating a few pieces. There's also a noticeable cayenne and red pepper. It also has a grilled steak character from the marinade of worcestershire and garlic/onion seasoning. 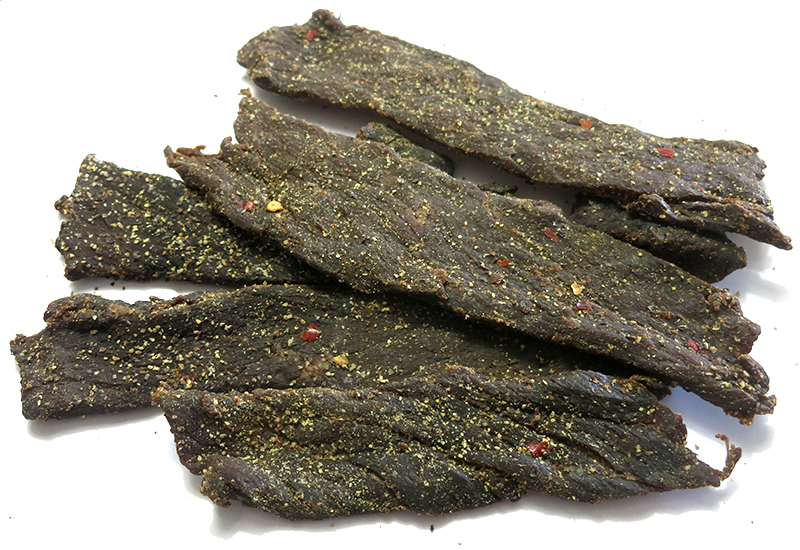 Otherwise, the flavor that seems to define this jerky overall is the saucy, worcestershire. It's not a pungent, straight-from-the-bottle intensity, but a little more watered down. After that, the black pepper and cayenne generate the next most strongest flavors, followed by the garlic & onion seasonings. The level of heat sits at a medium level (level 3 out of 5) on my personal heat scale. The meat consistency and chewing is excellent. It's soft and tender, but not mushy. 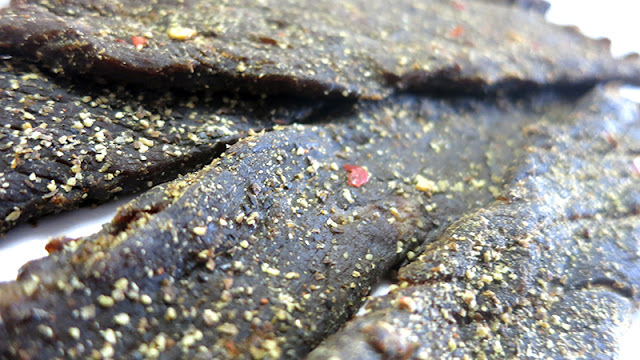 It still has a meaty, steak-like chewing, but is overall easy to chew. I find little stringiness, very little fat, and no unchewable tissues. Verdict: This "Original Pepper Steak" beef jerky from Hole In One packs a ton of flavor into each bite, with a fair amount of spicy heat. It holds up well to its advertised claim of "Pepper Steak", producing an experience much like a well-peppered, grilled steak. But after eating several bites, the ground black pepper tends to become overbearing. I really like the softened, worcestershire base flavor, and the meat consistency and chewing texture is great. I'm only able to pick up a light natural meat flavor, perhaps due to the heavier marinade and seasonings. But overall, a very enjoyable chew.